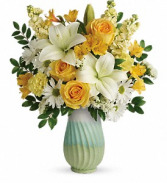 Peach spray roses, pink tulips, lavender stock, white daisy spray chrysanthemums and pink heather are arranged with myrtle. 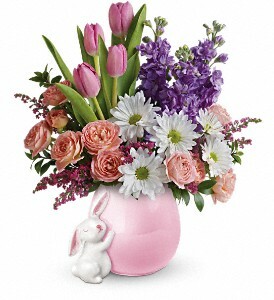 Delivered in a ceramic Send a Hug® Bunny Love vase. 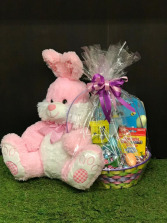 Plush Easter bunny with a fun basket filled with goodies. Coloring book and crayons and assorted easter candies.